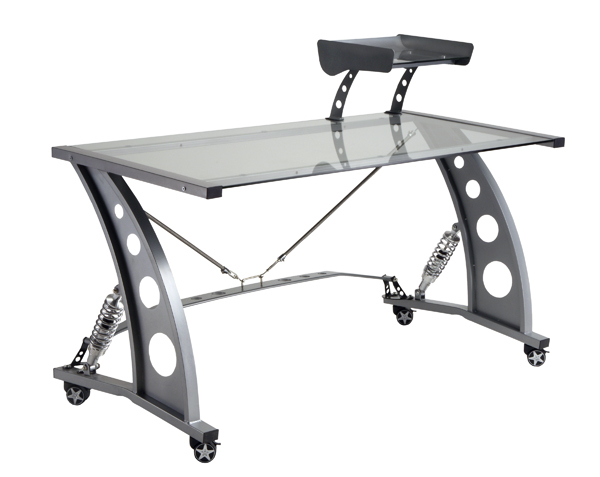 The PitStop Grand Prix Racing Style Desk provides you with the workspace you need to speed through your workday! PitStop furniture designs race-inspired pieces that provide form and functionality to any home or office setting. The metal and glass design of the PitStop Grand Prix Racing Style Desk displays clean lines and total performance�just like a racecar! The PitStop Grand Prix Racing Style Desk provides a generous 57.25� wide x 27� deep tempered glass workspace. To keep papers organized, the PitStop Grand Prix Racing Style Desk includes a spoiler-inspired document tray. The tray offers an organization solution to unruly paperwork. The PitStop Grand Prix Racing Style Desk features a tubular metal frame with some of the coolest racing elements this side of the racetrack! Two braided stainless steel hoses provide lateral support by connecting the side supports to a 51� metal alloy tower strut bar. The vertical supports feature racing shocks, providing both support and aesthetics. Lockable 22� style racing wheels provide your workstation with mobility when you need it.